With body removed, the AC Propulsion Power Electronics Unit (PEU) is visible in the Yokohama electric Race Car. 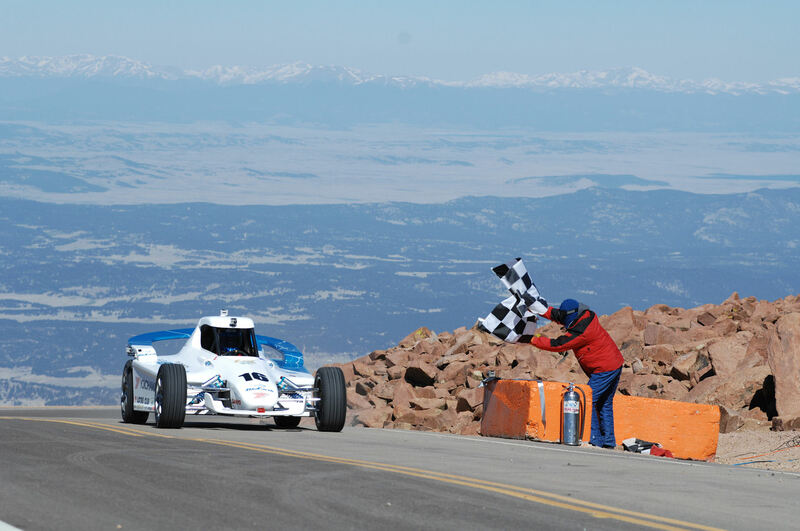 This Sunday, June 26th, 2011 a Yokohama sponsored electric race car set another EV record in the Pikes Peak International Hill Climb powered by an AC Propulsion electric drive system, similar to the one that powered the X-PRIZE winning MonoTracer-E. We’ve been a forever fan of ACP powered EVs as they have consistently blended high performance, high efficiency, fantastic regen, and superior reductive charging in their phenomenal, versatile, and compact bi-directional electric drive systems. I’m eagerly looking forward to the production MonoTracer-E which will sport ACP’s very latest and best electric drive technology. 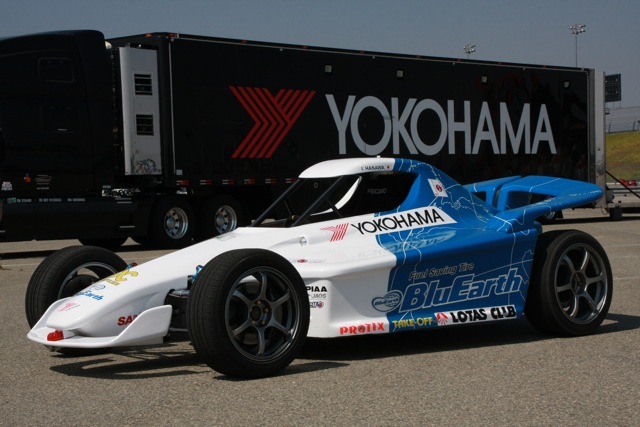 World Record Setting Pikes Peak International Hill Climb Yokohama sponsored AC Propulsion powered electric Race Car. San Dimas, Calif. (June 27, 2011) – AC Propulsion, a global leader in electric drive design, development and manufacturing, announced today that the Yokohama-sponsored electric race car using AC Propulsion’s proprietary electric drive system broke its own 2010 record at the 89th annual Pikes Peak International Hill Climb. 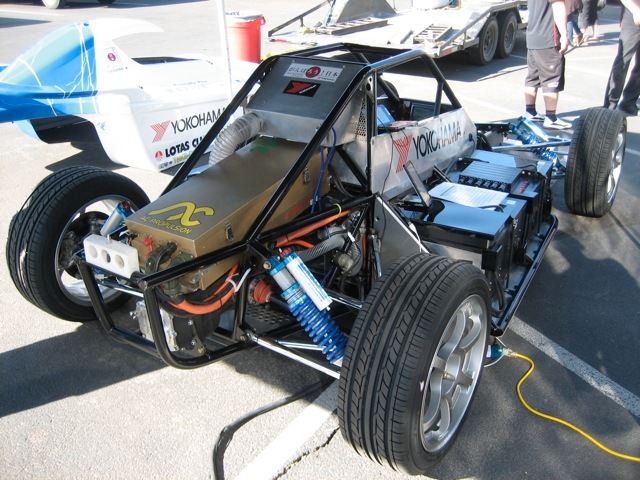 The AC Propulsion-equipped vehicle won the hill climb’s Exhibition Class and set a new EV record with a time of 12:20:084, besting last year’s record-breaking time of 13:17:575 by nearly one minute. It was also the race’s fastest EV among both cars and motorcycles. This year’s Yokohama EV, a rear-wheel drive, open-wheel race car, was built by Summit Motorsports and driven by Japan’s Ikuo Hanawa. It used fuel-efficient Yokohama BluEarth tires and SANYO Electric Co. lithium-ion batteries. The Pikes Peak AC-180 motor, rated at 268 horsepower (200kW) at 6000-7000 rpm and 258 lb.-ft of torque from zero to 5000 rpm, is a high performance version of the AC Propulsion AC-150 motor found in the BMW MINI E. The drive system utilizes the proprietary tzero-technology that also powered the MonoTracer MTE-150 to a first place victory in its category and achieved the highest efficiency overall in the 2010 Progressive Automotive X PRIZE. AC Propulsion is a global leader in the design, development and manufacture of electric vehicle technology. AC Propulsion’s proprietary tzero technology is a complete solution for electric vehicles, and can be customized for every class of electric vehicle, from a sports car to an SUV to an 8-ton city bus. AC Propulsion has been making EV motors without the use of rare earth materials for more than 20 years. The company is also a leader in the development of Vehicle to Grid (V2G) capable vehicles, as well as the research and development of V2G technology. Media contact number: 310-383-0956. About Yokohama: Yokohama Tire Corporation is the North American manufacturing and marketing arm of Tokyo, Japan-based The Yokohama Rubber Co., Ltd., a global manufacturing and sales company of premium tires since 1917. Servicing a network of more than 4,500 points of sale in the U.S., Yokohama Tire Corporation is a leader in technology and innovation. The company’s complete product line includes the dB Super E-spec™ – the world’s first tire to use orange oil to reduce petroleum – as well as tires for high-performance, light truck, passenger car, commercial truck and bus, and off-the-road mining and construction applications. For more information on Yokohama’s extensive product line, visit www.yokohamatire.com. This entry was posted in Peraves and tagged AC Propulsion, MonoTracer E, MTe-150, Pikes Peak International Hill Climb, Yokohama EV Race Car. Bookmark the permalink. Congratulations, well done, what a neat craft.